I always wanted to make a table runner, but I have a round table. Not quite a good match for those rectangle ones.... I finally had the opportunity when I found out our Neighbor loves table runners. 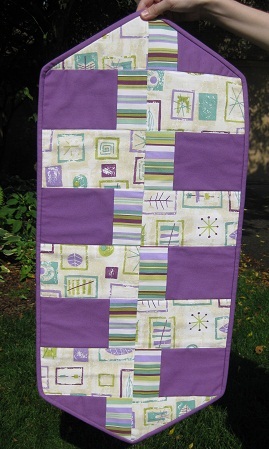 =) I showed her some options and she chose the "Triple Express Runner" from the quilt book Happy Hour by Atkinson Designs. She purchased the fabrics in a home dec weight which made for a sturdy runner. I made this pillow without a pattern. Our dog kindly separated my wool batting into tiny fluffy pieces ready for pillow stuffing.... probably trying to send me a hint seeing he LOVES our wool pillows. :) The pillow is made with a natural denim shell that I serged, stuffed and closed. 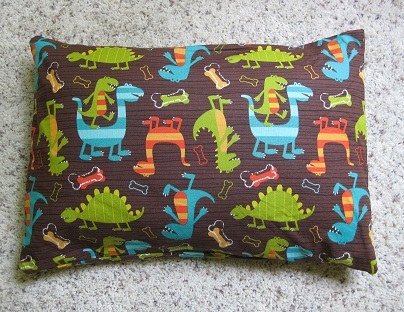 I then broke out my way cool Michael Miller "Brown Dino Dudes" fabric to make the case. 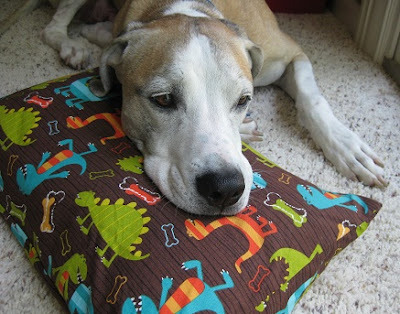 (This fabric also comes in flannel but I thought that would attract too much dog hair.) The case is what I guess you would call a slip case? I overlapped the fabric in the back so it stays closed but I can remove the "pillow form" when it's wash time. I made this apron for my Grandmother using the Scalloped Apron Pattern by The Paisley Pincushion. 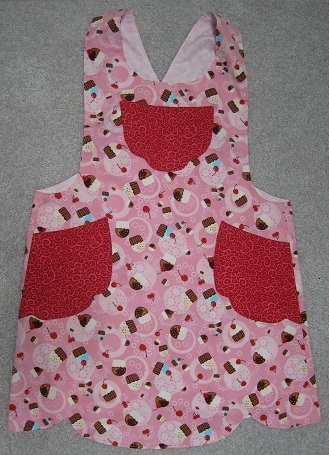 The apron is reversible, has darts, three pockets on each side and features a scissor back. I made this apron in size B.
I lined the pockets. I sewed them with right sides together and then flipped them right side out. I thought this made creating the scalloped pockets easier...for me at least. 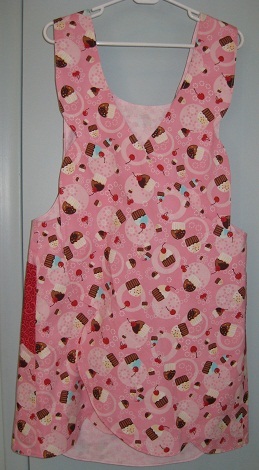 The recipient did not want to reverse the apron so I only put pockets on one side. I thought the pattern was well written and easy to follow. Be sure to clip it really close to the stitching where the scallops meet on the edges of the apron. I had to keep yanking those parts back through the small opening left for turning to re-clip them so they would iron nice and flat. The only thing I wish was different is the amount of fabric used on the scissor back. It's pretty much two layers back there when you are wearing it because each back piece is so large. That's just my ipersonal preference though. As it is, It will definitely keep your clothes clean! 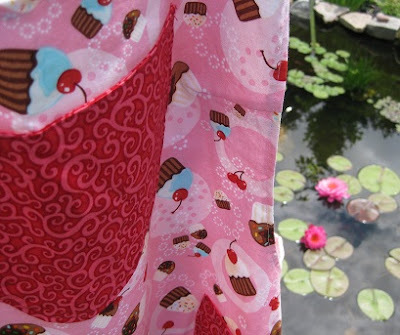 Cupcake fabric is "Confections" by Robert Kaufman fabrics. Front and back view. Click to enlarge.